Hey Guys, 😍 Hope Everything is going Well. Today I am back with most simple Card tricks for kids 😜. Here i have collected some of coolest card tricks which are very easy to learn and do in front friends and family. As we all wish to become super magician but most of us don’t get to that stage, that is only because of less practice. If you wanted to become professional magician in your life then you need to take this advise “Never Quit Practice”, Practice makes a man perfect. Start doing from today and for sure one day you will find yourself at higher level. as per our assumption you have some basics of card tricks which help you look more like professional magician 😜. If that’s not the case then below is short guide you must read it first. And remember, don’t tell the audience how it is done..keep them guessing. Here You Go With The List Of Card Tricks Click on Each to read that card trick. Guessing: Is this Your Card? Finally reach the card before the one the spectator placed back in the pack and you will know that their card is next in the pile! Even you can go past and then come back to it to make them think you have not found it. Move the cards back in order to do the trick again. It will work every time!. Sorting the cards by colour is the secret behind this trick. Separate the cards into black and red. Remember which colour you put on top. Do this before you start your performance, so that the audience doesn’t see. Fan out the top few cards and ask a member of your audience to pick a card from the top. Tell them to memorise their card. Then, fan out the bottom of the deck to allow them to put their card back in. Split the deck somewhere in the middle, and place the bottom half on the top to “shuffle” the cards. It doesn’t matter if the split isn’t exactly in the middle. To then magically find the card that was chosen, look through the deck. The colour of the one you want should be the only red card mixed in between the black cards, or vice versa. Pull out the card and announce, “Is this your card?” Your audience will be amazed with your brilliant mind reading skills! Learning to perform card tricks is a great way to exercise children’s cognitive thinking as well as build their self-esteem. This magic trick is the easiest card trick around! Without moving your mouth to show you are counting, count out 20 cards off the top of the pack and set those 20 aside on the table in front of you. This will be pile 2. The other pile will be pile 1. Offer the other half of the pack (pile 1) to your spectator. Ask him to choose a card. Tell him to memorise it. Ask him to give it back to you. Slip the card beneath pile 2 (the 20 cards you set aside at the beginning). Place pile 2 on top of pile 1. Turn the cards over to face you: so that you can see the front of each card. Count from the back of the pile until you get to the 21st card. That will be your spectator’s card. Counting exactly is very important in this trick. Practice counting in your head, without moving your lips so that no one knows you are counting the cards. When you first separate the pack into two piles, try to make it look like you are simply cutting the pack. If you are not confident, try setting your pile 2 aside before anyone is watching you. This card trick is really easy. Kind of silly but mainly to show kids. Start with a shuffled deck of cards. Fan out the cards and have someone pick a card and look at it without showing it. This is the card I chose as an example. Once they have memorized their card, split the deck and half and have them put it face down on top. The trick to this trick is to memorize the card that will be next to theirs. Kind of sneaky. This is just me putting the example card down. Don’t make what you’re doing too obvious. Most kids didn’t catch it when I did it. Now shuffle the cards just a little so you don’t separate their card from the one you memorized. Then start going through the cards until you find the one you’re looking for. Sometimes it helps To pass it and Go back to help the illusion. Their card should be to the right of yours if done right. This card game is a fun game that allows players to use their concentration skills to get through the game. Each player is dealt seven cards. The remaining cards are placed face down in the center of the table, forming a draw pile. The top card of the draw pile is turned face up to start the discard pile next to it. First player adds to the discard pile by playing one card that matches the top card on the discard pile either by suit or by rank (i.e. 6, jack, ace, etc.). A player who cannot match the top card on the discard pile by suit or rank must draw cards until he can play one. When the draw pile is empty, a player who cannot add to the discard pile passes his turn. All eights are wild and can be played on any card during a player’s turn. When a player discards an eight, he chooses which suit is now in play. The next player must play either a card of that suit or another eight. You can play this game with four players and play partnership. If you do this, the game ends when both members of a partnership discard all their cards. The player to the left of the dealer starts by placing any card down on the table. The next player looks to see if they have a card of the same rank. If they do, they place it down on top of the card, saying “Snip”. If they have another card of the same rank, they place it down too, saying “Snap”. And if they don’t, play passes to the next player, and so on. Whoever places the final card of that rank says “Snorem” and wins the right to start the next round with the card of their choice. Go fish is a great kids activity and learning game about numbers, patterns and pairs. Enjoy this fun, easy card game with the whole family and watch as your children learn as they play. Five cards are dealt to each player if three to six players are involved. With only two players, seven cards are dealt to each. All remaining cards are placed face down in a pile. First, choose a player to go first. On each person’s turn, ask any player for a specific card rank. For example: “Sarah, please give me all your 9s.” You must already hold at least one card of the rank you ask for. If the player you ask has any cards of the requested rank, she must give all of her cards of that rank to you. In the example, Sarah would have to give you all of her 9s. If you get one or more cards from the player you ask, you get another turn. You then draw the top card from the draw pile. If you happen to draw a card of the rank asked for, show it to the other players and your turn continues. Otherwise, it is the next player’s turn. You add the drawn card to your hand. NOTE: The “next player” is the one who said “Go fish.” When you collect a set of four cards of the same rank, immediately show the set to the other players and place the four cards face down in front of yourself. That is a “match”. Go Fish continues until either someone has no cards left in their hand or the draw pile runs out. The winner is the player who then has the most matches (sets of four). For younger children you can deem “matches” a pair of a rank (2 cards instead of 4) which allows them to “win” a few extra times and keeps the game moving. 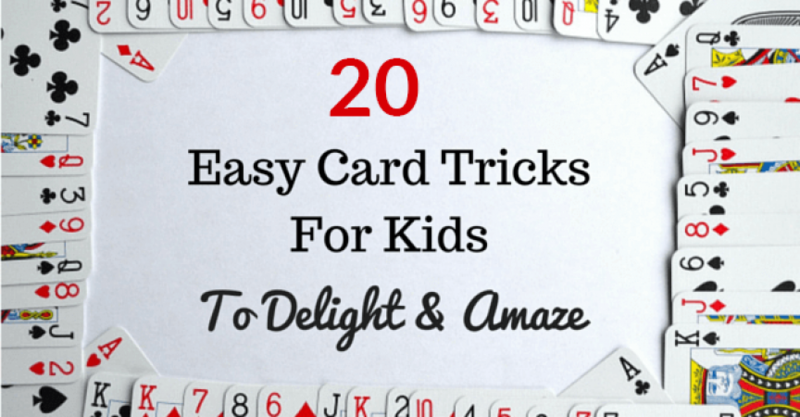 Remember these are card tricks for kids. Beggar My Neighbor, a card game suitable for small children that’s also known as Beat Your Neighbor Out of Doors and Strip Jack Naked, is a very simple game, requiring no strategy or planning at all. The objective of the game is to win all the cards from the other players. Two to six players: You can play with more than six players in a pinch. A standard deck of 52 cards: With four or more players, add a second deck of cards. This game has the great advantage that you don’t really need a complete deck of cards — the fact that a card or two is missing is almost irrelevant. Don’t forget to remove the jokers! To begin, one player deals out the whole deck in a clockwise rotation, dealing the cards face-down and one card at a time so that each player gets about the same number of cards. The players don’t look at their cards; they just form them into a neat pile, face-down in front of them. The player to the left of the dealer turns over the top card from his pile and places it in the center of the table (or floor, if you happen to be playing there). If the value of the card is between 2 and 10, the card has no special significance, and the play goes on to the next player. If the card is a court card (an ace, king, queen, or jack), the game becomes a little more exciting. The next player then has to pay a forfeit, meaning that she has to turn over some of her cards onto the central pile. If the turned-over card is an ace, the second player must turn over four cards one by one onto the pile; and the card is a king, he has to pay three cards; if a queen, two cards; and if a jack, one card. If all the forfeit cards the player turns over are between 2 and 10, then the player who turned over the court card takes up the whole pile and puts it under his own cards. But if the player turns over another court card during the course of the forfeit, then the debt is deemed paid off, and that player doesn’t have to turn over any more cards. Instead, the next player must pay the forfeit dictated by the second court card and hope to turn over a court card in the process or concede the whole central pile to that player. When a player has no more cards left, she is out, and the game continues without her. The last player in the game, who accumulates the whole deck, wins. Your success at Beggar My Neighbor depends on the luck of the draw; if you get a good smattering of court cards, you will probably win. If someone feels bad because he lost, you may want to remind him of that. But that doesn’t mean you can’t congratulate him if he wins! Because the game theoretically can go on for a long time — and is ideal for long car journeys, waiting for planes, or similar situations — you can also agree that the player with the most cards at a certain predefined time is the winner. This is a great card game to teach the kids. It will keep them entertained for hours as they try to beat their opponent. With a little bit of guidance, the kids will be beating you in no time. A fantastic game to be pulled out on family night! The object of War is to win all the cards in the deck. Aces are high, 2s are low. The tricks are played according to rank; suits are ignored. All 52 cards are dealt to each player (if you have two players, each player has a total of 26 cards). You do not look at your cards – they are placed in a stack face-down. Holding the stack of cards face-down in one hand, you use the other hand to flip the card face-up on the table in front of you. Each player flips a card, so if you have two players you will have two cards facing up in front of you. The highest card wins the trick and the trick winner takes the 2 cards and places them at the bottom of his or her stack of face-down cards. You continue play like this until one of you has accumulated all the cards. In the game of War, a war is a means to break a tie. When two cards of the same rank are played, you break the tie by playing new cards in addition to those already on the table. The player with the highest-ranking new card wins the tie breaker and all the played cards. If you both play a card of the same rank – let’s say you both play a Jack – you have to have a war. You leave the Jacks face-up on the table and put one card on top of your Jack – face-down – and then another card face-up on top of the face-down card. So you’ll have the following configuration of cards in front of you: the tied Jack, a face-down card, and a face-up card. The person with the highest face-up card takes all the cards on the table and places them face-down at the bottom of their stack. If the top card is another tie, you place another face-down card, then a face-up card – basically, you keep going until someone wins the war. This is the best and fastest way to accumulate cards. If one of you runs out of cards in the middle of a war, the other player wins. Snap is a very simple children’s game for two or more players played in Britain, North America and perhaps other countries. It is a rare example of a card game of almost pure skill, the skills required being accurate observation and quick reactions. The player to dealer’s left begins and the turn to play passes clockwise. At your turn you simply turn the top card of your face-down pile and place it face-up alongside. In this way each player forms a pile of face-up cards beside their face-down pile. If at any moment two of the face-up piles have matching cards at the top (for example two sixes or two kings), anyone who notices this shouts “snap!”. The first person who shouted “snap!” takes both matching face-up piles and adds them face-down to the bottom of their face-down pile. The game then continues as before, beginning with the player to the left of the last one who turned a card. If a player shouts “snap” in error, when there is no match, that player’s face-up pile is taken away and put in the centre of the table,where it becomes a snap pool. This happens several times there can be several snap pools. If the top card of any player’s pile matches the top card of one of the snap pools, the first player who calls “snap pool” takes both piles. Very young children may play a version where players turn over their cards onto a single pile in the centre of the table. In this version, when two consecutive cards match, any player who notices this may call “snap” and the first player who calls wins the centre pile and adds it to their own cards face down. A player who calls “snap” incorrectly must give the top card of their pile, face down, to the player of the card for which they wrongly called “snap”. As usual, players who tun out of cards drop out of the game and the last player holding cards is the winner. If two or more players call “snap” simultaneously, the central pile is moved aside to become a “snap pool”. Subsequently, if the top card of the centre pile matches a snap pool, the first player who calls “snap pool” wins the snap pool pile. Some play that if two or more players shout snap at exactly the same time, the matching piles are combined into a single pile, which forms an additional snap pool, placed in the centre of the table. If two or more people call “snap pool” at the same time, the player pile that matches the snap pool in question is added to it. In this variant of Snap, which is suitable for about four to eight players, each player chooses a different animal at the start of the game. The dealer deals the cards to the players face up, one card to each player in turn, forming a face up pile in front of each player. When the top cards of two piles match, the owners of those two piles must call the name of the other player’s animal. The first to do so correctly wins the other player’s pile and places it under their own. The winner is the player who has most cards when the deck runs out. This card game is fun and children will enjoy playing it. They will use their concentration skills and learn to play this game fast. Spit is a game where you need to try and get rid of all your cards as quickly as possible. Once you shuffle the cards deal them to each player. Each player then deals out five piles of cards in a row in front of himself, with all cards face down. The first pile has one card, the second two cards etc until the fifth pile has five cards. Turn the top card of each pile face up which is known as stock piles. Each player will have eleven cards remaining in his hand which are known as the spit cards. When both players are ready, they say “spit” together and each player turns his top spit card face up, placing it in the middle of the table between the two rows of stock piles. Keep on playing as quickly as the players can, using only one hand and moving one card at a time. The goal is to play the 15 cards in your stock piles onto the spit piles. When an Ace is showing on a spit pile, either a King or a 2 can be played on top of it. When a player moves a card from one of his stock piles to a spit pile, he may turn the next card in the stock pile face up. If a player has less than five stock piles (because one has been exhausted by playing cards into the spit piles), he may move the face up card from another stock pile to fill the empty slot. He may then turn face up the card that was below the one he moved. A round ends when either a player runs out of stock cards by playing them all, or neither player can make a legal play and both players still have cards remaining in their stock piles (but not their spit piles). David Blaine Sews His Mouth Shut in Insane Trick (w/Jimmy, Priyanka Chopra & The Roots).